The King, the bear and the maiden fair. No knights this time, as the joust has been disturbed by arrival of several villains. Tyro king of the Scotts, and a maiden of the court are threatened by a band of brigands, a ferocious bear and a dreadful giant. 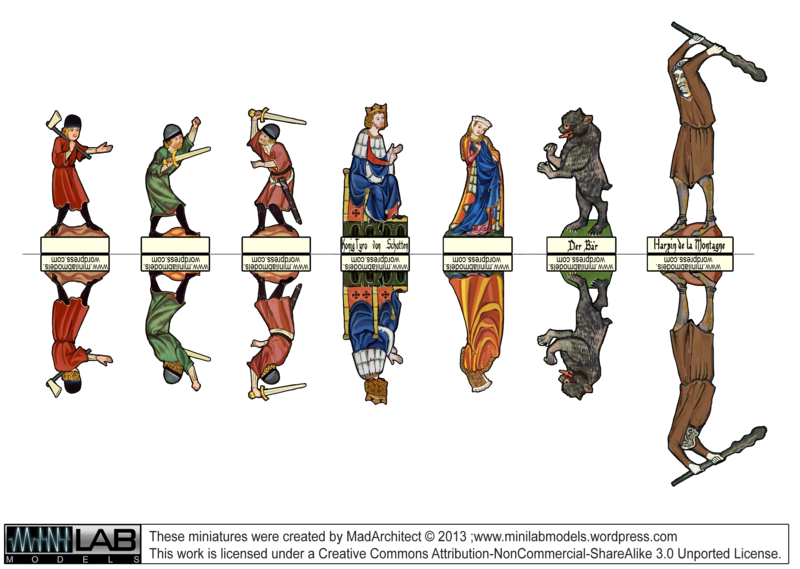 All figures with exception of the king and the giant are side characters of Codex Manesse charts. The fair maiden is an object of affection of Graf Gotfrit von Nifen. Thugs are infamous murderers of knight Reinmar von Brennenberg. The bear is soon to be killed by Herr Hawart to become a figure of his crest. And the giant Harpin de la Montagne is our special guest star from Chretien de Troyes “Yvain, le Chevalier au Lion” Garrett MS 125 manuscript, after a serious face reconstruction surgery. Just to add flavour to the knights collection. Enjoy. More knights. Soon a whole army. Just finished 4th team of Codex Mannesse Knights. Still there is a lot of material to make more, also fighters on foot, manesse terrain, fair maidens, minstrels and other wait in queue. 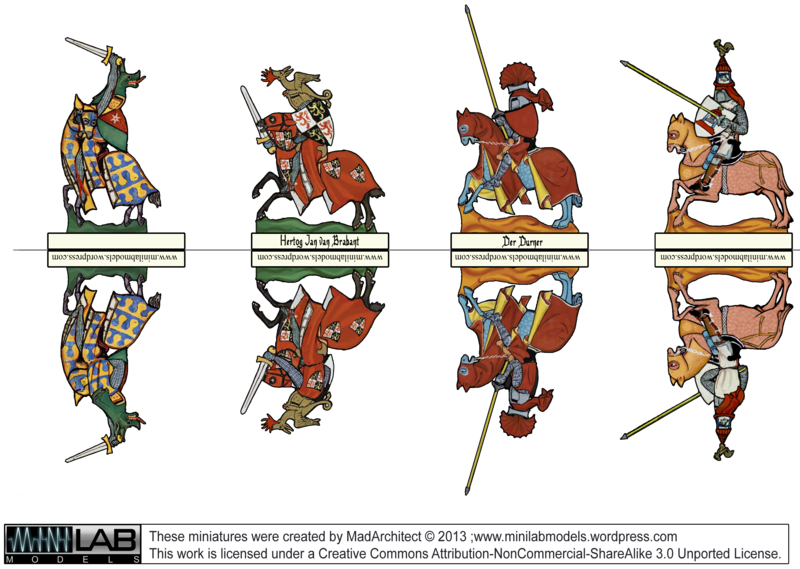 I am thinking about some simple jousting ruleset to use with these minis, although it is just an idea for now. In the mean time here is the fourth team of knights. Codex Manesse Knights 3rd team. 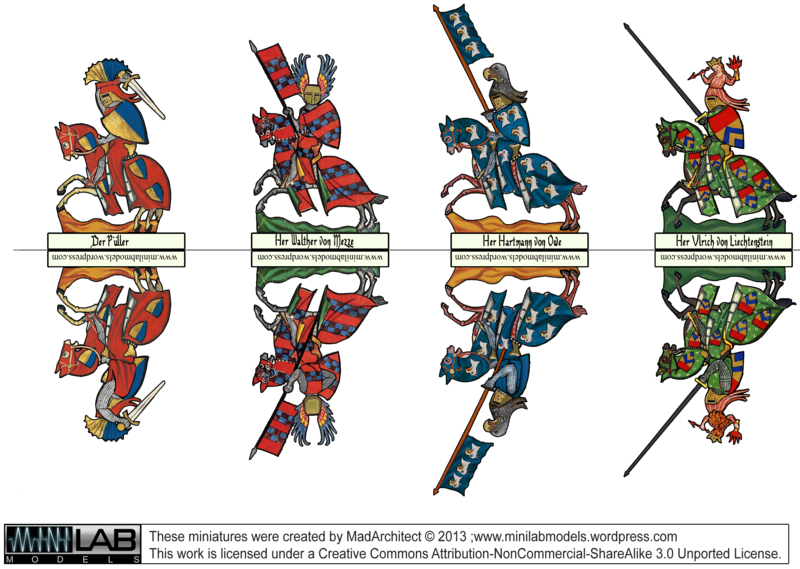 Another set of Codex Manesse Knights. This time taken from only two illustrations as the unnamed gentlemen were opponents of Hertog van Brabant and Der Durner. The duke’s adversary required an urgent head transplant as on the original illustration his own head was split by dukes sword. I borrowed his new a head from duke’s bannerman. I hope he don’t mind. Also the horse of unnamed knight from Der Durner illustration required some serious surgery as it was missing the back part. Anyway another four knights join the fray. Enjoy. P.S. As with previous four right click on the image and “save target as” to download. Minis are formatted for ~30mm gaming scale. More knights and a wizard. That was a rough week, and the coming one seems not to be any easier. I had no time to develop my 3d designs, however I’ve found out that a while each evening spent on Codex Manesse minis works wonders for me helping to shake off daily stress. 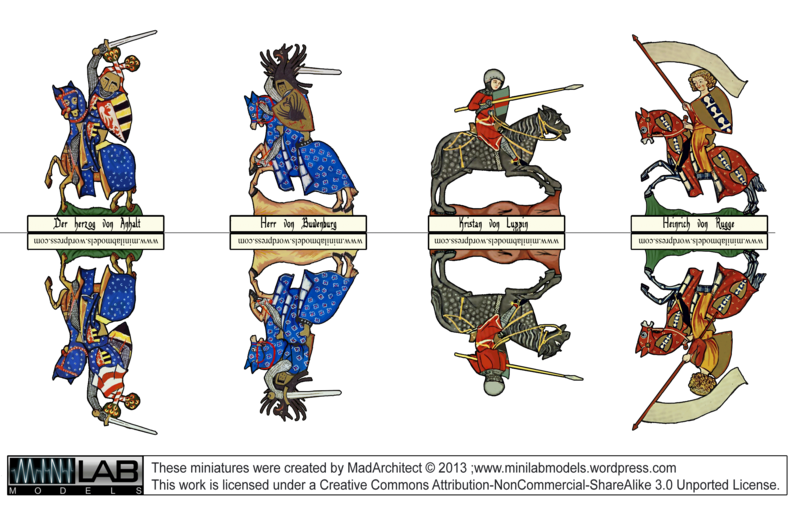 Below you will find effects of this treatment 🙂 If you want these fine gentlemen to enter the joust together with the previous four just rightclick>> save target as on the image for the full res. file. Some of you may have heard of, or seen excerpts of “The great songbook of Heidelberg” more known as Codex Manesse, one of the major iconographic sources on knightly culture of XIII-XIV centuries. If you haven’t I highly recommend taking a look at it here at the site of University of Heidelberg. It contains over a hundred songs and poems by medieval minnesanger (central european troubadours of noble birth), together with illuminated portraits of their authors in different context, some of them at war or in a joust. I thought it would be fun to make gaming miniatures of original illustrations, so I have extracted several knights, made their backsides and turned them into minis scaled to ca. 30mm gaming scale. The height of the knight himself was taken as a reference for scaling and original proportions were retained to keep the style of original artwork, which mean they are completely out of proportions by modern standards :), but I think that is part of their charm. The names on the tabs are identical with those in the Codex.